ME: I think we should get chooks again, Ants. ANTHONY: Yes – good idea. 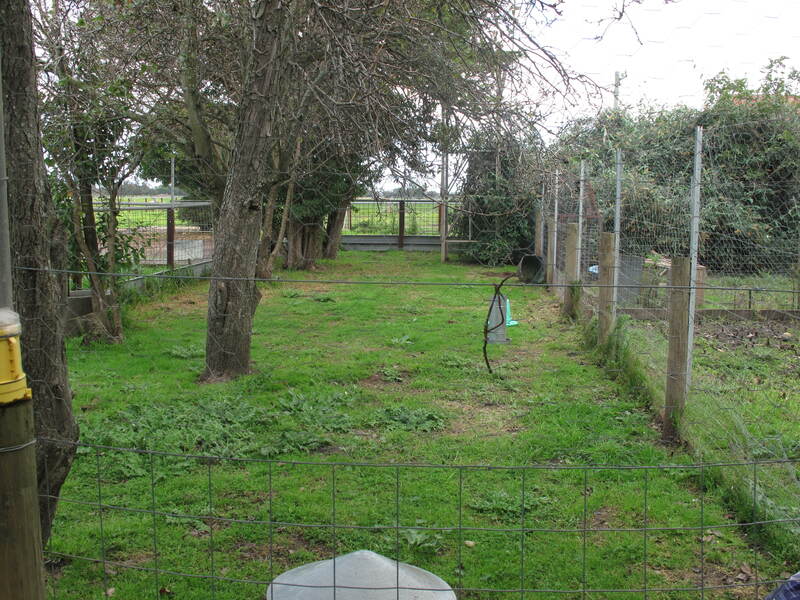 ME: But this time we should keep them in the chook-yard and not let them out at all – safer from the dogs and foxes. What do you think? ANTHONY: So when do you start work? ANTHONY: F said you’d be working for R.
ME: Okay, the veterinarian if you want to be precise! Well, I’m not sure. Do you think I’d be any good at it? ANTHONY: Yes, I do because of the chooks. ME: Well I do love animals …. There is a fair amount of debate around whether to ‘go with the flow’ – or not – when it comes to interacting with people who have dementia. With Anthony, I tend to fluctuate between ‘going with the flow’ and telling the truth so yesterday I suddenly became a vet. But other times, when, for example, he is worried that his mother is home alone, I will gently remind him that she died many years ago. He usually accepts this quite well and is sometimes a bit embarrassed that he has forgotten this fact. ‘Going with the flow’ isn’t so simple though. If someone with dementia thinks there is a monster under their bed, it’s obviously not a great idea to agree. But if someone with dementia thinks there is a family pet under the bed, it’s obviously a great idea to agree. Carers who work in nursing homes walk a tightrope of tact when responding to residents who have dementia. Alleviating dementia-induced distress can be a minute-by-minute challenge. As Anthony is my husband, I don’t have to be quite so tactful with him and will sometimes go as far as to say, “You’re talking rubbish again!” OR “You’re hallucinating again!” We can turn the confusion into a joke and/or a hug that way. 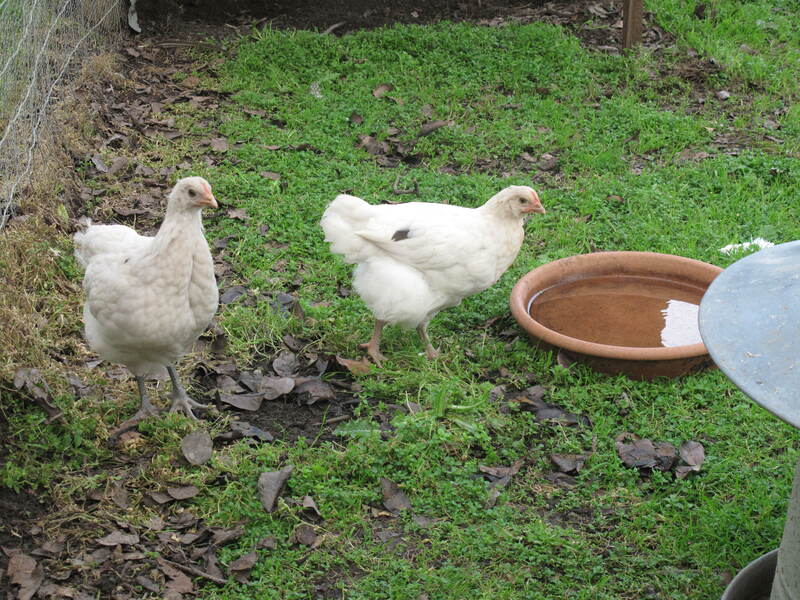 Anyway, here they are – the two new hens. I was feeling a bit biblical so I have named them Martha and Mary. Mary is the one with the black feather marking. As you can see they have a huge yard! I can’t wait to show these pictures to Anthony this afternoon! It is over three months since I was employed part-time in the dementia cottage of the nursing home and I really miss seeing those residents oftener than I can now. Even though I visit from time to time during the week, it still feels a teensy bit awkward due to my status of employee having changed to that of visitor. I know many of the relatives and most of the staff so I have been trying to figure out what gifts to bring that will make my occasional visits quiet and seamless – unobtrusive. 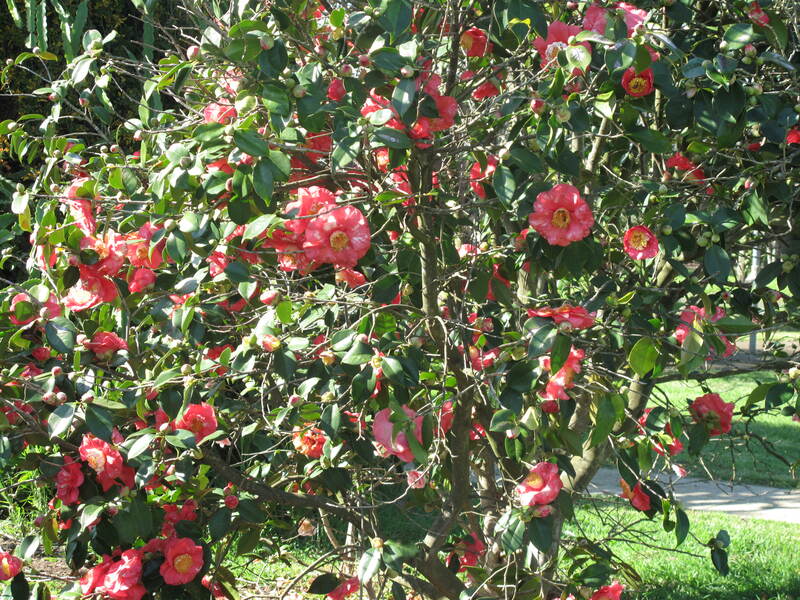 Anyway, one of the things that delights Anthony most (apart from chocolate cake with lashings of cream) is the singular bloom of one of his many camellia trees. 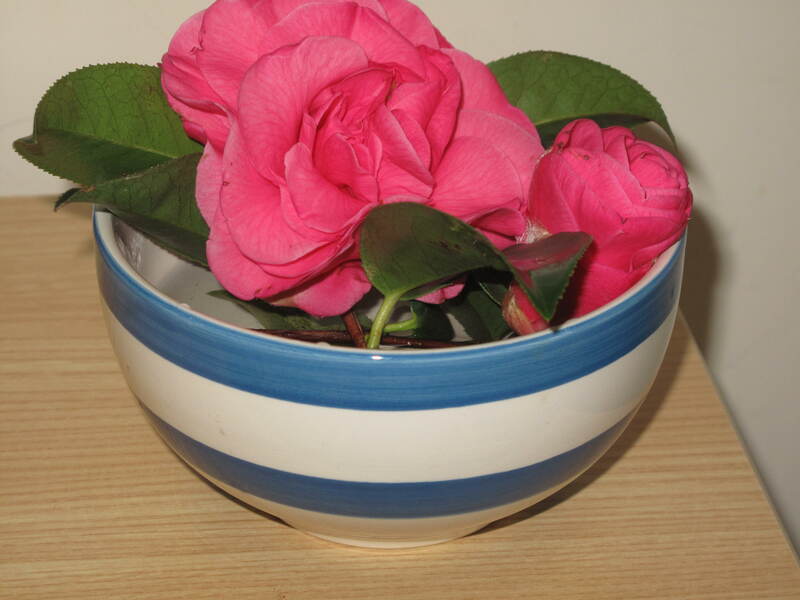 The above is one of the many I bring in daily to Anthony’s room and that’s what gave me the idea of taking lots of camellias into the dementia cottage. After all, when there is someone at the door with flowers, the door is usually opened! My heartfelt thanks to the staff who look after those with dementia, and those in high-care like Anthony. You are legends so perhaps I should bring a camellia tree in! I have never picked so many flowers in my life! 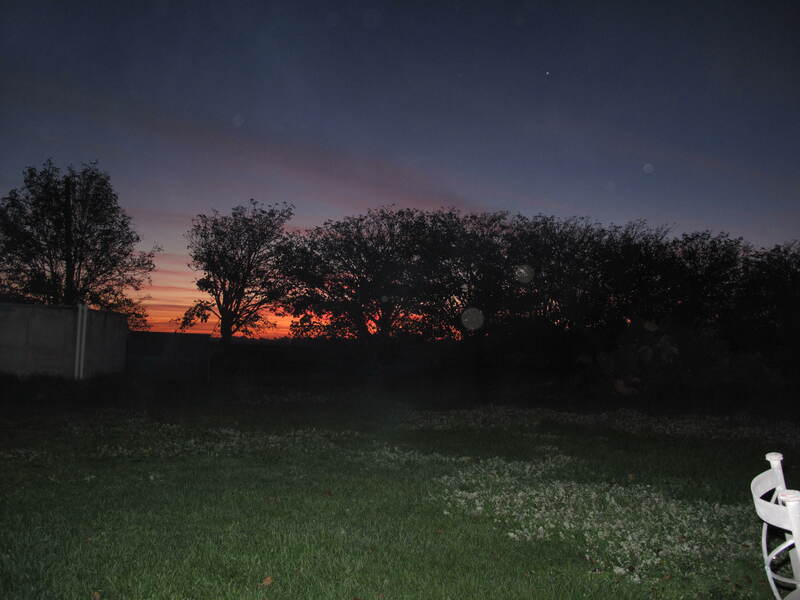 The above photo shows how out-of-control the wormwood hedge had become during the last few years of Anthony living in the nursing home. 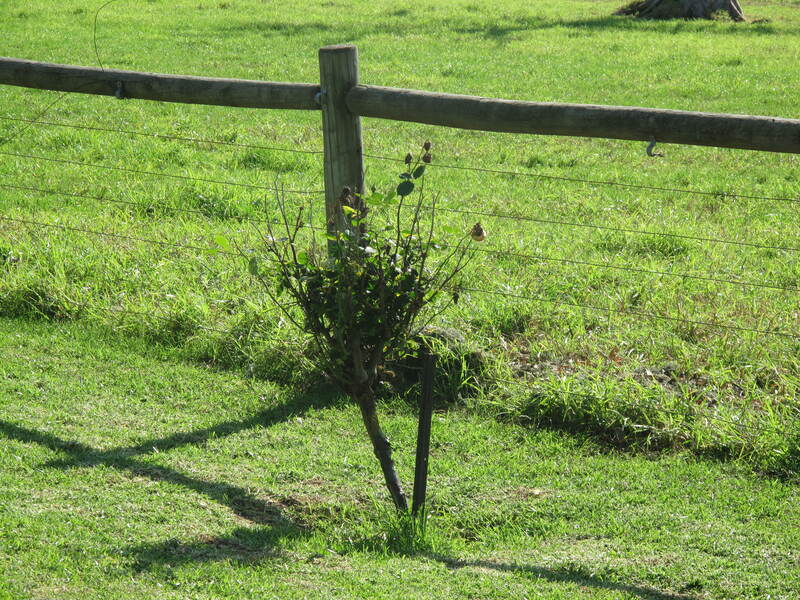 He used to take such pride in trimming that unruly hedge, in pruning the roses, in picking the camellias, in mowing the lawns etc. As for me? I was not the least bit interested, and never have been, in gardening. But then, a couple of months ago, I discovered Jake. I had previously employed a lawn service – a lovely couple – just to do the lawns (5 acres) and Ming was sometimes unhappy about this because he felt he should be doing it himself. Anyway, the lovely couple moved into a different profession, Ming got full-time work and, as the grass soon leapt up to knee level, I decided I needed help. So Jake came to the rescue and not only has he controlled the wormwood, he has also made this place look like it once was when Anthony was in control of things. 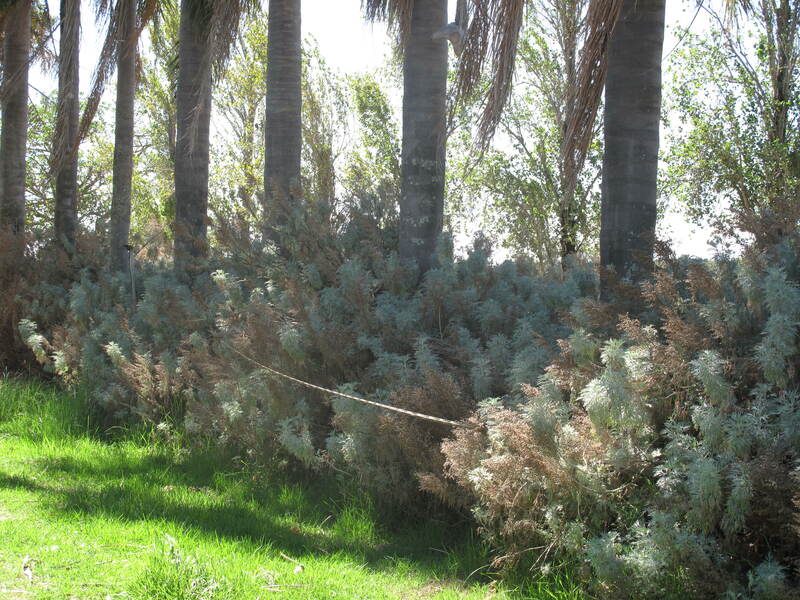 Yes – the above photo is of the same lengthy wormwood, now ‘Jaked’! Anyway, yesterday this whole place was blitzed by Jake and I came home from the nursing home in the late afternoon and felt as if I were entering a park. The nostalgia was acute as I was reminded of that very first day when my parents dropped me off at this farm to be interviewed by Anthony’s rather formidable mother for the job of house-keeper/companion. I was a teenager so I didn’t really notice the garden but do remember vividly the impression that this was a place of beauty and magic. 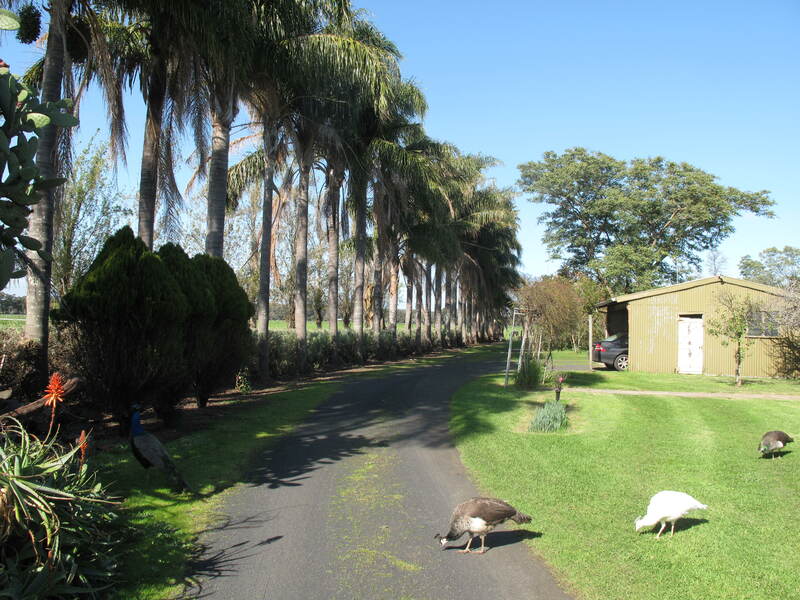 Three decades later, this wonderful marriage tangled up by Anthony’s diseases and entry into the nursing home, this place, this farm, became a place of despair – mine. So I guess I just kind of gave up any interest in either the house or the garden; I was just too sad. Fast forward to now and Jake’s lawn service has been a godsend in that this wonderful man, and his son and off-sider, have taken an interest in the place. I know now that I can call on Jake for garden jobs beyond lawn-mowing. Anyone who can turn something shabby into a work of art is a person worth knowing. 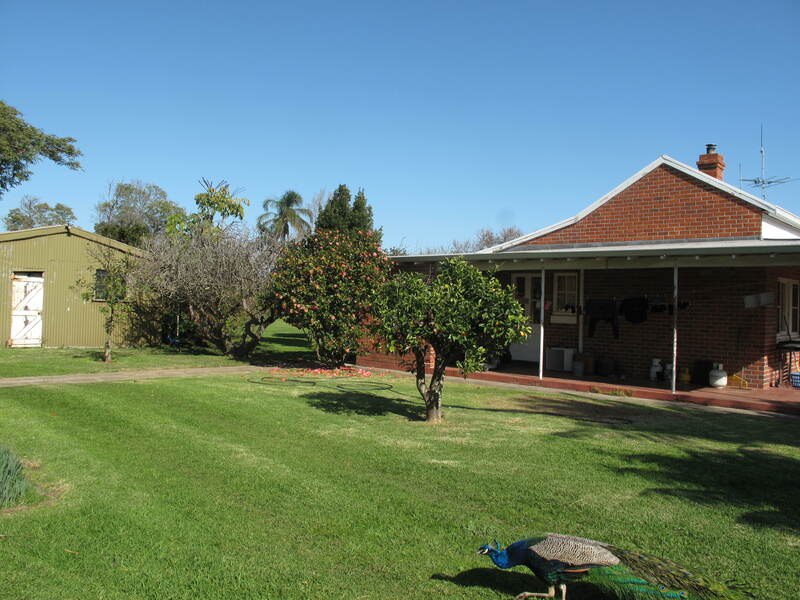 I have a couple of my new gardening friends coming over tomorrow morning to hopefully give me their advice on vegetable gardening and chooks, so I think I will just pretend that I mowed the lawn myself. They are sure to believe me – hahahaha! 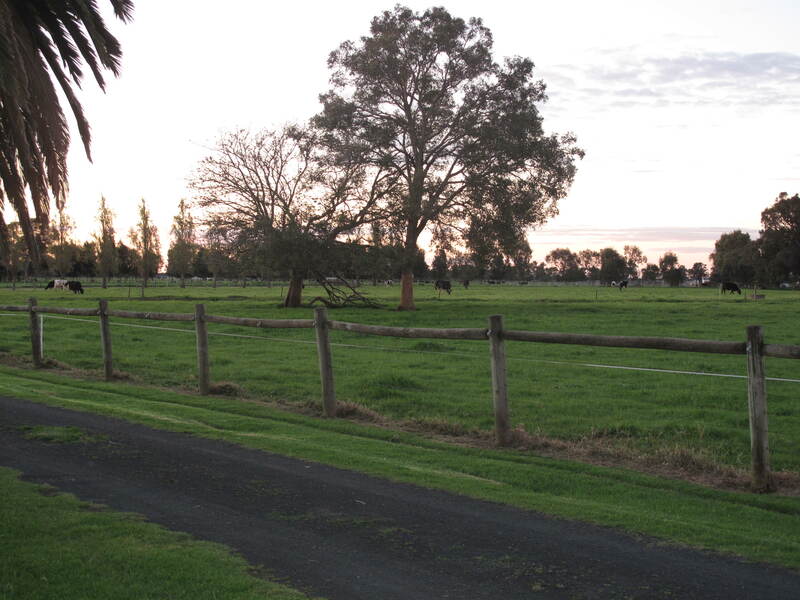 When Anthony asked me about the faulty electric fence today, I reassured him that it was fixed. Me: Yes! Would I lie to you? Me: Well guess how I know the electric fence is working? Me: Because I put my hand on it and got a terrible shock! Anyway, now that I am being more diligent at recording our conversations, I’ve noticed that my responses to Anthony’s questions or statements (often bizarre due to dementia) are really bland. 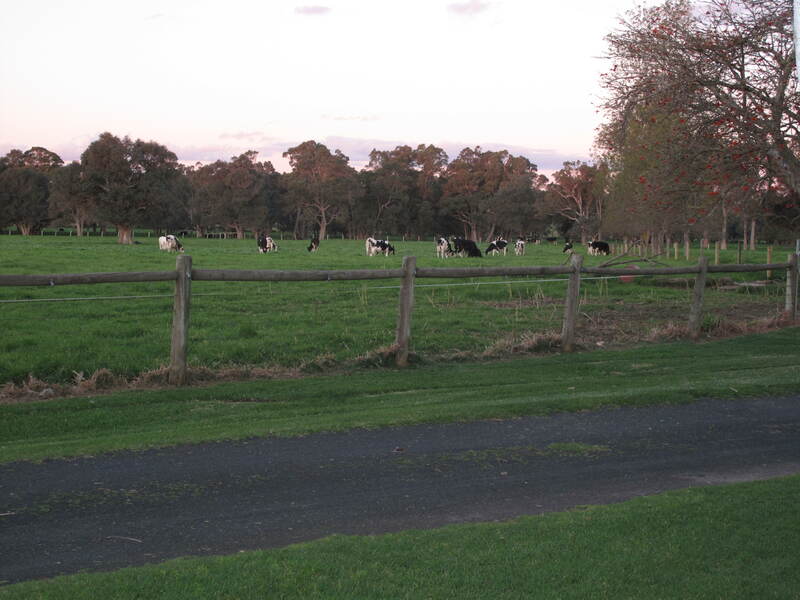 So today I thought I’d liven things up a bit by telling the electric fence story – total make believe! There was a period of time recently where I thought Anthony had completely lost his ability to speak, converse, tell stories. But now – just like the return of his smile – his verbal skills seem to have improved. Of course he is still dozy, and/or incoherent, and sometimes has that blank Parkinson’s expression on his face, for much of the time. The fact that Anthony looked through his nursing home window and saw an electric fence that wasn’t there gave me an opportunity to enter today’s ‘story’. I am so excited to realise something I should have realised years ago – that I can make things up to match what he is saying – that I can use my imagination to meet his hallucinations. Oh I am such an idiot! Okay, this is what happened. I stayed with Anthony later than usual this afternoon because his favourite nephew arrived for a visit and I didn’t want to miss out on that. Then, Anthony’s 5pm dinner arrived as the nephew was leaving, so I ended up helping Ants with the soup, mornay and dessert. Once that was done, I turned the television onto the ABC News channel and put it on mute as I gathered my stuff to leave. Usually I say I am going shopping, or to the chemist and I’ll be back soon but tonight I told the truth. You didn’t come back last night. Where did you go? Me: That’s right! I remember now! Anthony: You always say I’m the forgetful one. Me: Well I’m getting just as bad. Anyway, I went home to make the pea and ham soup – remember I showed you those massive ham hocks? Anthony: Where is the soup? Me: Whoops – I forgot to bring you some. I will tomorrow. Sorry! Me: Really? So you must be exhausted! Anthony: Yes. So I just want you to get some paper animals in the glove box. Me: Okay – anything else? Anthony: A couple of paper animals. Anthony: Well, they should be in the letterbox … but dead. Me: Don’t worry, I’ll take care of it. Anthony: You might be sitting on them. Get up. Me [getting up]: Nope – no paper animals. Anthony: They don’t appear to be there. Me: You’re hallucinating again, Ants. Me: Can you just shut up so we can watch the series? Anthony [fussing with the blanket on his knees – a constant thing]: The little chap’s had a good day; he hasn’t moved much. Me: That’s good. It means he’s happy, Ants! So the fragments of our afternoon conversation ranged from eloquent to incoherent, nonsensical to logical, silent to noisy etc. and I still haven’t figured out if the ‘little chap’ on Anthony’s knee is baby Ming or a dog! All in all, it was a great afternoon but, just as I was leaving, Anthony suddenly became agitated. Anthony: But you can’t leave me here. We need to be in the same bed. Me: I have to go home to rescue the pea soup and I’ll come back tomorrow morning. Anthony: Why can’t you stay here with me tonight? I don’t know this place! I’ve only ever stayed here once before and it’s where J. and P. got married. Me [sternly]: Listen, Ants, you are in a nursing home and you are sleeping here tonight and I am going home but will be back tomorrow morning. At this point one of the wonderful carers, having overheard our conversation from an adjacent room, came into Anthony’s room to reassure him and I gave him a millionth kiss and left. It’s the first time for ages that I have felt distressed driving home. No tears but just distressed that he was distressed. So an hour ago I rang the nursing home and the nurse-in-charge told me that he had just been settled into bed but she would go and check again. She is, by far, Anthony’s favourite and, when he was upset and confused earlier he actually asked for her by name, describing her as the nice one in the red shirt. She has even been nicknamed his ‘girlfriend’. Just going to the chemist to get toothpaste; what kind of chocolate do you feel like; do you want beer? etc. AND: I won’t be long – see you soon…. Home is where the humour is! After posting that boring boredom post yesterday, and in thinking about writing more seriously again, I made a couple of simple decisions. 2. Concentrate on blogging my conversations with Anthony, not just the current ones but the past ones. I have already blogged some of these but I have also made notes over the years so I will have to transcribe these. The reason I want to write this book (which has almost written itself via my blog) is mostly to demystify the nursing home experience – to make it less frightening for both relatives and prospective residents. Of course there are other reasons to write this book, i.e. I wish I’d known about the UN-stereotypical symptoms of impending Parkinson’s Disease (inability to blink, blank face, constipation, hallucinations, strange behaviours, weird wordage etc. etc.) before we got Anthony’s diagnosis all those years ago. So my focus over the next few weeks will be on dialogue – mostly Anthony’s and mine with a bit of Ming thrown in. I think that these dialogues are an important way of recording/remembering all of the words that are so easily forgotten, or dismissed as nonsense. Me: Ants, you’re so skinny! (patting his absence of a tummy). Are you doing sit-ups? Anthony: Yes (looking at me in a sneaky way). Me: So, when exactly do you do these sit-ups? Anthony: When they need doing. He makes me laugh more than he makes me cry, this fantastically funny husband of mine! When Ming was little he only once said, “Muuuuummmmm – I’m booooored!” because I immediately retorted, “The only children who ever get bored are booooooring themselves!” From that moment, he became more self-sufficient. Okay, the above is a summary of several similar conversations with little Ming not long after I stopped being interested in finding the missing lego pieces in a Harry Potter castle or two. Today, in the nursing home, helping Ants with his lunch, watching the television series, my mother’s visit – the almost clockwork regularity of this routine – struck me…. I recently read an article about how boredom can be a good thing, that it allows a person to sit back and re-perceive things and embrace the boredom as a kind of contentment. I do understand this because I have experienced it. And with Ants these hours are valuable time together as he gets more and more incapacitated. This whole acceptance thing has been wonderful for all of us but I’m beginning to realise that I have also stunned myself with a kind of boredom. And, if boredom = boring, then I am guilty. I will still spend many hours per day with Ants, but am now excited about writing more seriously; I’ve even planned a schedule of writing …. No way will I let that boredom thing creep in. This afternoon I went into town to see Anthony. By the time I’d done bits and pieces of paperwork and housework, I almost didn’t go in after all. I didn’t feel like going in, but then the guilt got to me. I arrived later in the afternoon than usual after doing a couple of in-town errands. Anthony was asleep in his armchair so I put a blanket on his knees, made sure the heater was on, put the television on mute and sat down next to him. Usually Ants wakes up when he hears my voice or anybody’s voice but this afternoon he was in slumber mode and, no matter how much noise I made, he didn’t wake up! Nurses came and went, and he even swallowed his 4pm pills semi-asleep, then I had to talk on my phone for ages, then Ming came in after knocking off, then a couple of the nurses came back for a chat, other staff came in to change towels in the bathroom, a cup of tea was brought in …. …. And throughout these couple of hours I watched (on and off) our latest television series with my left hand inside Anthony’s shirt collar. But he still didn’t wake up! I wanted to tell him so many things: how the camellias are thriving (I’ve been taking little flowerettes in lately); that Ming has a new friend; that I’ll bring more chocolate tomorrow; that I missed him so much that looking at photos of our years before Parkinson’s sometimes made me cry; and how he was, to me and to Ming, the best example of a good father and husband. Of course I have poured out these various profundities to Ants before but today he was so unwakeably asleep that I had to pour all of that stupid emotional stuff into the toilet paper in his bathroom. On resuming my position by Anthony’s side, my hand back inside his collar, I wiped his chin then saw that he was smiling in his sleep. Once again I tried to wake him gently but it wasn’t possible to get much more than a few blinks and then he was asleep again. Then, all of a sudden, Anthony began to chuckle in his sleep. Of course I have seen this before with him but only occasionally. This time, the chuckling went on and on, for well over an hour! It was amazing and beautiful and I am so glad I was there to witness this. 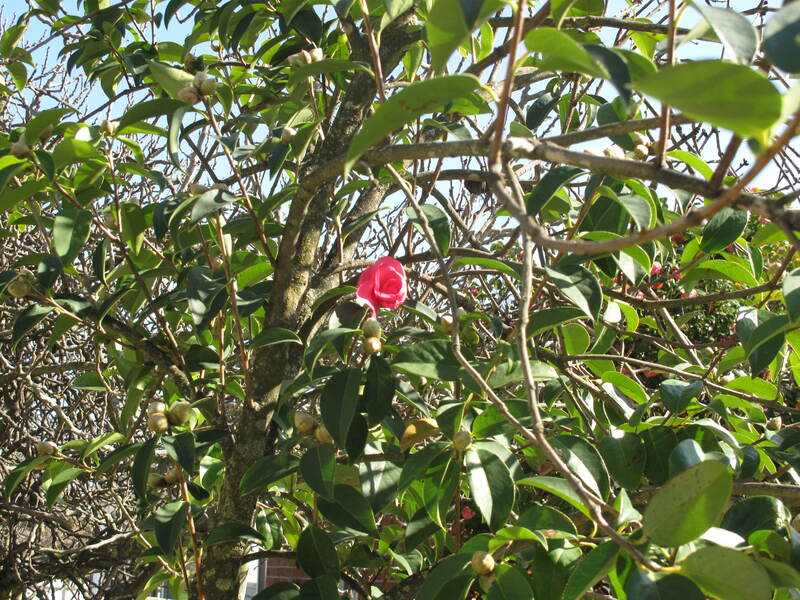 Tomorrow, I will pick camellias to take in, then I will tease him about his sleep-chuckling haha! Anthony’s increasing ability to smile again continues to flabbergast me. This afternoon, I arrived at the nursing home and, on entering his room, saw that two of our best friends (a husband, F, and wife, J) were already there. J whispered to me that Anthony’s face always lights up when I come into the room. They are frequent visitors to Anthony, so they often see this but the fact that J said this to me really made my day. J has a sense of humour that is slicingly clever and she has this ability to get straight to the point with a unique mixture of irony and kindness. When she invited Anthony to the movie she and F were going to see – about euthanasia – Anthony politely declined and I guffawed. F (an old school friend of Anthony’s) constantly teases him about past girlfriends but this afternoon Anthony managed to eke out a couple of eloquent retorts and the mutual banter was a delight. I poured a couple of small glasses of wine (it’s Sunday!) then F and J left to go and see the euthanasia movie. It was such a happy hour and I am so grateful for these friends who help to normalise the situation. J told me that when they arrived and asked Anthony where I was he told them I was hanging out the washing! I think this means that perhaps my presence in his room every afternoon (well, mostly) explains my absence in the mornings and nights. It is possible that he thinks I am doing chores, cooking dinner, possibly even gardening! Now that I am over the whole tragedy-of-husband-going-into-nursing home, and now that Anthony, too, accepts the status quo and often thinks we are at home anyway, our afternoons are happy. I usually sit on the side of Anthony’s armchair and we watch another episode of whatever television series I’ve acquired; he often sleeps the afternoon away; I sometimes socialise with the staff and other residents; cups of tea + cake are delivered; his pills are dispersed by his favourite nurse, D, who Ants calls his girlfriend. When I was unwell last week my wonderful mother substituted for me and sat next to Anthony in his room, knitting, until he suddenly said “Are you going yet?” Hilarious. And Dina, my decluttering friend, visited Ants on a day when she and I were supposed to be having brunch (but I was still bilious). What an incredibly kind person to do this for me! The funniest of these many happy hours, though, are Ming’s visits to Anthony. Big, loud and assertive, he goes into Anthony’s room and, if Ants is asleep in his chair, Ming doesn’t wake him. But if Anthony is awake, Ming will lie on the bed and they will have a chat. It’s probably quite alarming for staff to come into Anthony’s room and see this great big hairy-legged boy-man-creature lying on Anthony’s bed with no care whatsoever about protocol or the cleanliness of linen. Sometimes, when Ming’s and my visits to Anthony coincide, there is friction between Ming and me. I’m not quite sure why this is but he seems to relate better to Ants when I’m not there. And vice versa. Nevertheless, Anthony’s pride in Ming is overwhelmingly evident and he often ‘sees’ Ming in the corner of the room (hallucinations). I’ve begun to appreciate every single hour, especially the happy ones. These hours more than make up for the desolate ones. The other morning I entered a new realm; I went along to a local community gardening group get-together. Even though I knew some faces, there were only three people I actually knew (the ones who invited me). It was such a comfortable and lovely group and nobody that I spoke to seemed to mind that I didn’t have a clue about gardening. I hesitated to admit to anyone that I have never actually liked gardening; instead I said that I was interested in learning (which is true!) And when one person told me that established roses were almost impossible to kill, I had to admit that that I only had a couple left. 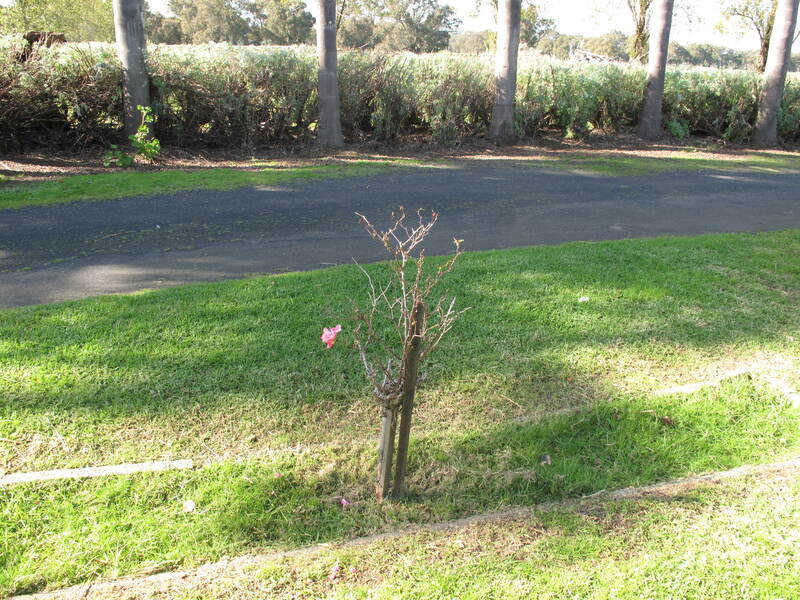 In fact, there are only two rose trees left on the driveway and, yes, I do feel a bit guilty about this. However, my decision to stop watering plants a couple of years ago, long after Anthony went into the nursing home, was based on economics. Every time a tap/hose is turned on, the bore is activated and the electricity bill soars. Nevertheless, because of Anthony’s gardening prowess decades ago, we have the most beautiful garden! The challenge now will be for me to learn how to grow vegetables and it is so great to have a local group of people from whom I can derive tips! My lack of gardening prowess is embarrassing and my close friends laughed without inhibition at the fact that I was joining the gardening group. PS. To blogger friends: I haven’t been very well lately so haven’t kept up with posts.